At the end of the nineteen-seventies, the French heavy goods vehicle sector was affected by the widespread consolidation trend that began thirty years earlier. 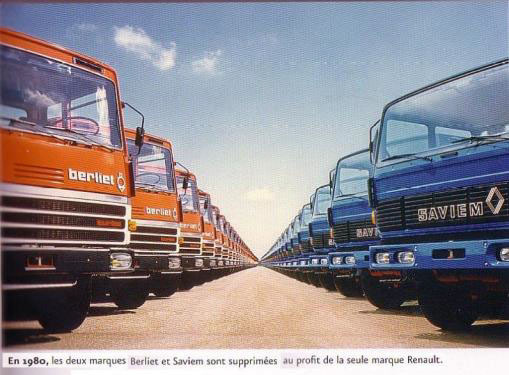 Renault’s takeover of Berliet and subsequent merger with SAVIEM in 1978, opened a new chapter. Renault Véhicules Industriels, a subsidiary of the Renault Group, was now the country’s only French HGV manufacturer. The company employed more than 40,000 people, including 22,000 from Berliet, and owned 12 industrial facilities. The Berliet and SAVIEM brand names, initially maintained, were eventually abandoned in 1980. The Renault lozenge replaced them on all its truck radiator grilles. The product lines merged and all the models were renamed for greater consistency. Book : Patricia Kapferer and Tristan Gaston-Breton, Renault Trucks, une autre idée du camion, Le cherche midi éditeur, 2005.